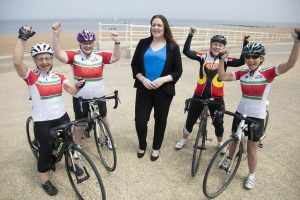 Arrival of women’s elite pro cyclists to give £2 million boost to Colwyn Bay | News by Wales Express News, People Before Profit! Colwyn Bay is set to receive a £2 million boost when the elite riders fight out the final stage of the UK’s premier women’s cycling event on the sea front next month. It’s a first time in Wales for the Ovo Energy Women’s Tour, a gruelling five-day 423-mile race, part of the Women’s World Tour of 23 races across 10 countries. Colwyn BID ; Pictured is Cheryl Williams from Colwyn BID with cyclists Ruth Threadgold, Sharon Williams Julie Allen and Sue Williams. Thousands are expected to line the route on the final day, Sunday, June 17, when the riders will fight it out for a record £80,000 prize pot with the biggest crowds at the finish in Colwyn Bay. And last year’s race was watched in over 100 countries worldwide on television on Eurosport and on ITV4 with daily highlights programmes repeated online. Last year’s event attracted almost 100,000 spectators each day and each stage generated an estimated £2 million for the local economy with race organisers expecting similar crowds in North Wales with the largest concentration in Colwyn Bay for the finish. The Tour starts with 17 teams and over 100 riders on Wednesday, June 13, at Framlingham, in Suffolk, and continues through the Midlands to Worcester before hopping over the border for Sunday’s deciding leg. The final stage will see the field take on the Tour’s toughest ever stage, from Dolgellau, along the Cambrian Coast and then up into the mountains of Snowdonia before descending to Colwyn Bay’s Porth Eirias. Colwyn BID manager Cheryl Williams said: “It’s a major coup to have attracted such a major sporting event to Colwyn Bay especially for the climax of the race to take place here at Porth Eirias in Wales’s Year of the Sea. Jim Jones, Managing Director of North Wales Tourism, said: “This is the first time the Women’s Tour has been outside England and it couldn’t have chosen a better area for the event’s finale. “The route takes in the spectacular scenery of Cardigan Bay before heading into Snowdonia’s magnificent mountains before emerging again for a dramatic seaside finish and all that will be televised globally. Councillor Louise Emery, Conwy County Borough Council’s Cabinet Member for Economic Development said: “We’re thrilled to have the UK’s first ever international stage-race for women in Conwy County, reinforcing once again we have the right environment for great events. Sue Williams, of Rhos on Sea Cycling Club which celebrates its 90th birthday this year, said: “This is great for all the cycling clubs in North Wales and particularly for women cyclists and we want to encourage as many women as possible to come on the day. This year’s expected pacesetters include British Olympic champions Dani King and Katie Archibald as well as international superstars such as London 2012 gold medallist Marianne Vos and European champion Anna van der Breggen as they battle for the Green jersey of race leader. Challenging them will be two of Wales’s finest, Olympic gold medallist Elinor Barker, from Cardiff, and Carmarthen’s Manon Lloyd, at 21 a Great Britain internal and one of the best young riders in the country. The route takes them 75 miles and the cyclists could face tricky and windy conditions along the coast before heading inland through spectacular scenery with lung bursting climbs including Category One Nant Gwynant and high speed descents. Mick Bennett, Race Director for organisers SweetSpot said: “It promises to be a thrilling finale to this year’s race between Dolgellau and Colwyn Bay. A one-hour highlights programme of every stage will be broadcast daily on ITV4 and Eurosport and available on demand via the ITV Hub and Eurosport Player.